I was on a photography kick last night and set up a convoluted area in my basement where I thought I might be able to get some well lit shots using some strong work lights. My goal was to get some ideas for the Board Game Gift Shop but there were a few in there that I decided to upload to Board Game Geek. 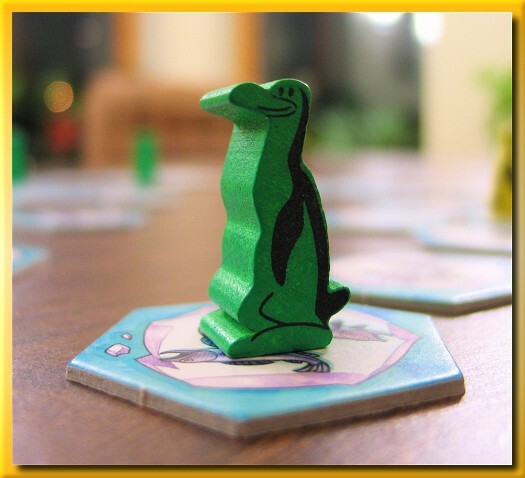 On a side note, these photos kicked up my total BGG thumb count to 4000. Thanks! After 27 shots at trying to time the drop of the cube(s) at the precise moment I finally captured an image that I felt had that je ne sais quoi that I was striving for. Dropping cubes in the castillo in El Grande not only gives you that feeling of hiding something from your opponents but it also gives the game the added tactile dimension of sound and motion. Next up was this fairly straightforward image of the El Grande king and all his ‘men’. Each player uses a stockpile of cubes (caballeros) and strategically places them on the board in an attempt to garner dominance and therefore points during the various scoring opportunities throughout the game. 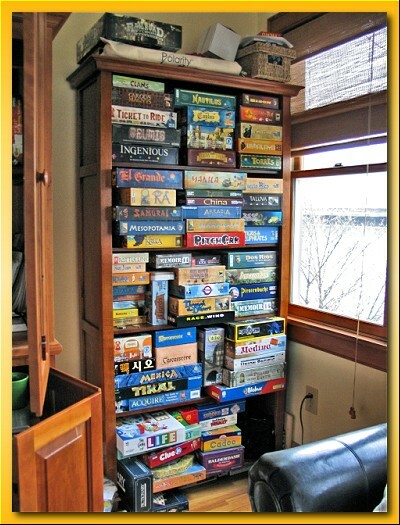 A recent shot of my collection taken for a forum posting on BGG. We met at Paul’s house this month. Thanks for hosting Paul! While we waited for our sixth player, we started a round of Formula Motor Racing by Reiner Knizia. The game is still new to me having only played once with my kids but there’s not much to it. After a five minute rule presentation we got started and took our lumps in the chaos that ensued. All twelve cars are in play regardless of the number of players so with five, one controls only two like-colored cars with one “uncontrolled” pair of cars going along for the ride. In the end, we might as well have just flipped a coin to determine the winner but by having cards in one’s hand and by having bits on the table I suppose one would call it a game. From the way the cars progressed, I’d say all of them were fairly “uncontrolled”. The copy of the game that CABS owns has little soft-ish rubbery cars and my copy has hard plastic cars. I enjoyed the little rubbery ones better. They looked…I don’t know…yummier? Like little gummy cars. About half way through the chaos, our sixth arrived and so after we finished FMR, we broke out Union Pacific. We’d played this at Paul’s house recently so after struggling with the cards a bit (I’d arranged the dividend cars appropriately through the deck twice only to realize that I’d forgotten to deal shares to everyone and then forgotten to flip up the face-up draw pile first) we got started building the links. Every time I’ve played, the final dividend card has come up within the last 10 cards and last night was no exception (next to last!). However, this time the first three dividends flopped out very early in the game. Most everyone was busy focussing on retaining dominance in non-UP links only to have the dividend card flip up causing that nauseating wave of realization that we had once again missed out on the UP dividend payout. How can that dividend card come out again so quickly! Damn you purple dividend card! 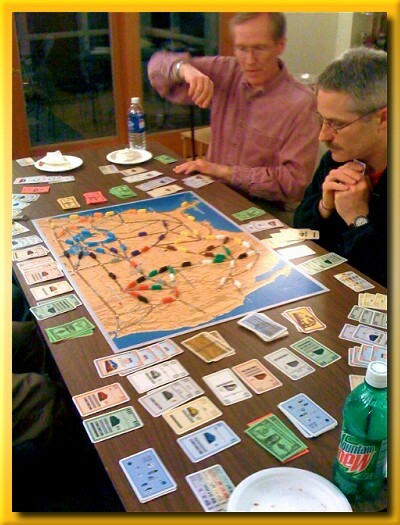 I enjoy Union Pacific and I greatly enjoyed being able to replay a game with my group. Jason mentioned to me that we have fun as a group playing all the new games but that we’re missing another level (not better just different) of fun when everyone is familiar with the game. I’m beginning to agree with him. It is satisfying to play a game that we’re all comfortable with. But damn you purple dividend card! Tim, Keith, and Jason cut out after UP so Rich, Paul, and I talked a bit about Railroad Tycoon. I got out the board and we talked at a high level about the game. I really want to play again! It was starting to get late so the three of us closed with Hey! That’s my Fish!, a neat abstract that warms up the brain nicely. Thanks everybody for coming and see you all next month. I felt that the rules for when you should pay for a river crossing when entering a city was ambiguous so I went digging. I ran across this thread on BGG that helped clarify the costs. I was taught that you needed to look very closely at the position of the river in relationship to where the track enters the city. Although you can make a decision using this method, I don’t think the artwork was intended to be used in this very detailed manner. If I’m not mistaken, we were paying extra to build track a few times for river crossing when technically we shouldn’t have. The diagram above (created by BGG’s coldark) depicts the widely(?) agreed upon ‘standard’ for the rule interpretation (AFAIK). 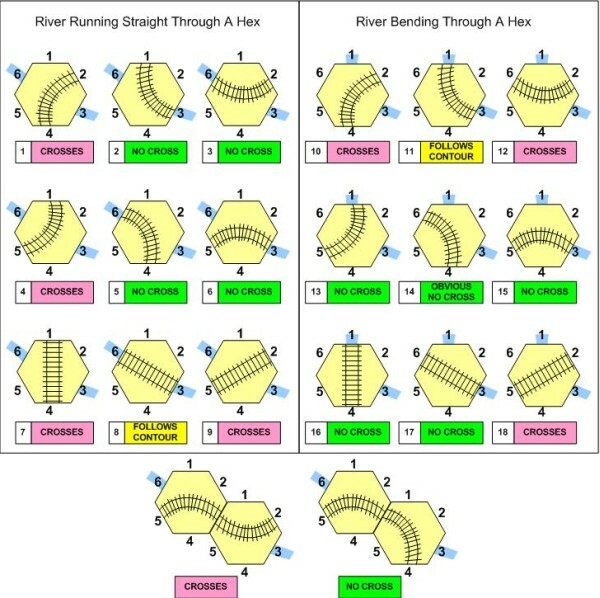 So, although the artwork may depict a track and a river entering one of the six hex sides, the ordering with that hex side is irrelevant to determining cost. For example, using situation 3 above, assume the river and the track connect with a city in position 6 on the hex. Although the artwork may depict the track entrance on the 5-ish side of the 6, I feel that the track builder would not pay the extra $1000 since both features are within the boundaries of the hex’s position 6. The bottom two figures depict how, if taken individually, there would be no cost to cross the river. However, if the link at some point clearly crosses the river, then the extra cost would be incurred on the tile that completes the crossing. This thread has yet another description of the rule that I’m not sure I would agree with. I’m going to stick with the diagram. 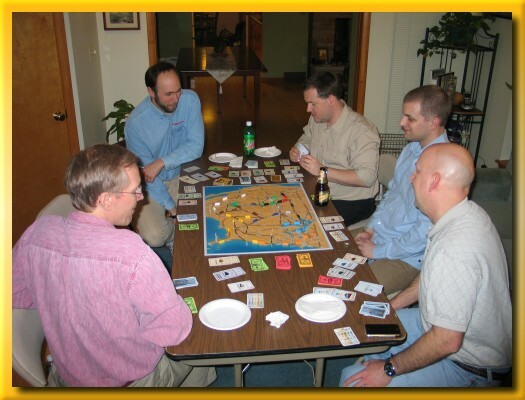 Once I’d ordered Railroad Tycoon I asked Jason, a coworker; game group member; and experienced player, to come over and teach me. I looked back in my photo archives and realized that it’s been almost a year and a half since the first and only time I’d played so I knew I’d need one game to learn and another to feel like I wasn’t lost. In a game with as many variables as RRT, it’s a pipe dream to expect competitive play after only a game or two. The goal was to get at least three of us together to play two back to back games. Unfortunately we only got to play one game since our third player had to leave. However, I feel like I have a much better feel for what’s going on and might be able to play somewhat intelligently the next time. There are so many choices to be made and many things to watch out for unless you want a runaway winner. The game is awesome and I’m looking forward to more plays. Thanks for teaching it Jason. 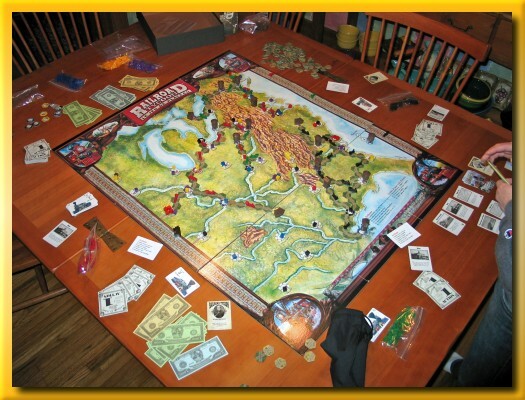 I also wanted to mention that I struggled for several days trying to make a decision about trading Power Grid. My decision was tough because it is one of my few six player games and my game group hovers around six. I could never get PG to the table since it is a fairly long game and we just never committed to just playing it. I was also never sure that I truly liked the game either. I enjoyed the resource market and the pressure to use your income wisely across cities, plants, and resources but it felt too mathy, too much like work for my tastes. So…off it went and in return, I received a copy of Nautilus. I do have a concern that it will sit unplayed next to many of my other great four player games but I’m bound and determined to get them on the table by hook or by crook. 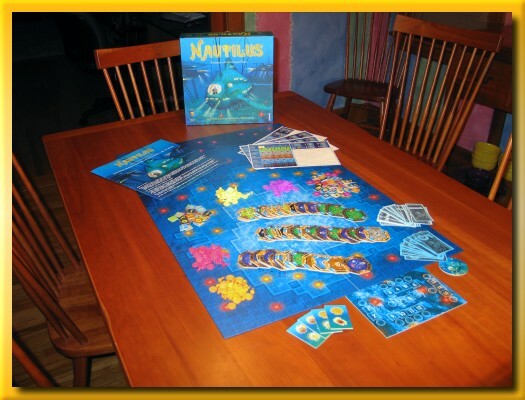 I played Nautilus at CABS over a year ago and greatly enjoyed it so I’m looking forward to more plays of that as well.